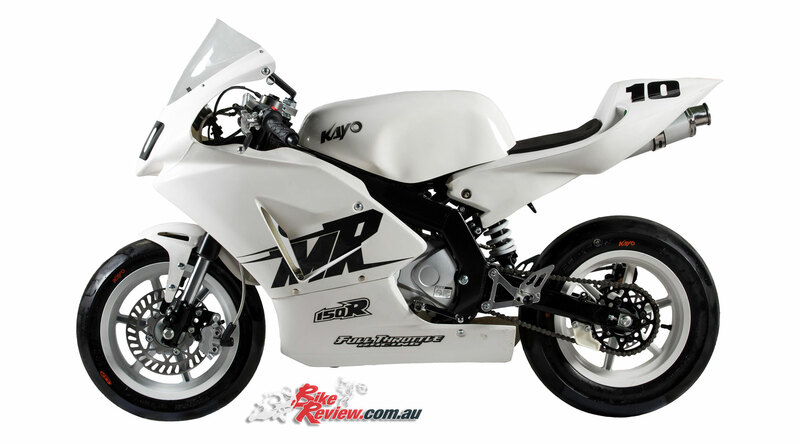 We first heard about the Kayo 150 MiniGP bikes and the Motostars.com.au Junior Road Race Series from professional world endurance and MotoGP rider Damian Cudlin, who is now a riding coach. 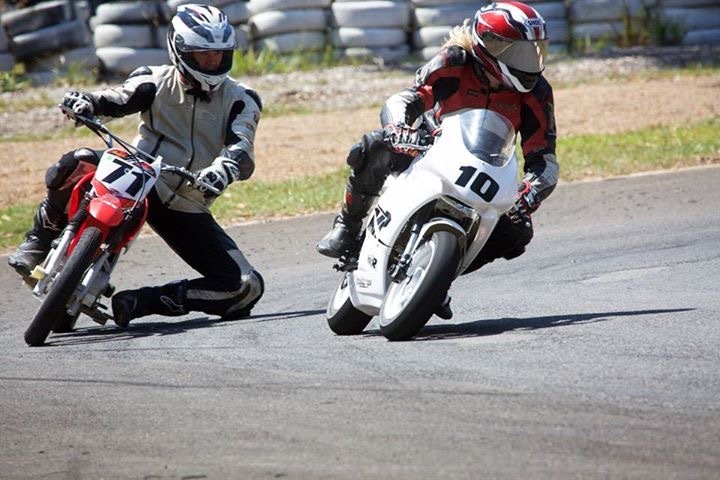 During his time racing professionally around the world, Cudlin has seen how popular and useful it is to get junior road racers started on go kart tracks in places such as Spain, Italy and Malaysia. Kart tracks are more widely available, cheaper and safer, but still provide an excellent training platform and opportunity in terms of road racing techniques. So we set off to Damian’s hometown of Port Macquarie to test out the Kayo MR150 on the 1.052km long, 8m wide Pacific Park kart track at Burrawan Forrest Dr, just near the Port Macquarie turn off to the legendary Oxley Hwy. We took the opportunity during the easy four hour drive north from the Central Coast of NSW to stop at the Nabiac National Motorcycle Museum and saw some beautiful old bikes like the Fuji Rabbit scooter and the extremely rare YZ60 Yamaha mini dirtbike from the 1980s. We even met a fellow enthusiast at the museum counter, who said his son was also going to the kart track day to have a bit of fun on his motard. Booking accommodation in the area was easy but could be a bit more challenging during the peak holiday season, which is something to keep in mind. We had dinner in one of the many restaurants by the water in town and the area was very popular and with a great atmosphere. There were 30 riders out on track for our day, however Cudlin has had up to 50. 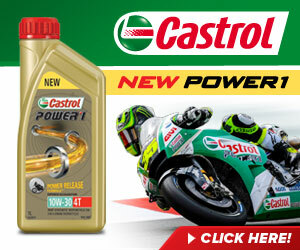 He also offers coaching throughout the day to Juniors, Seniors and motard racers. We took a CRF80 modified for the tar with a set of scooter tyres, axle sliders and a catch bottle, which easily converted the standard dirt minibike into a junior motard. We also hired a Kayo MR150 for the day and swapped riding it throughout the sessions. Our test riders were myself, a 100+kg successful former club racer; Sal, a 65kg keen trackday try hard; and James, a 22kg eight-year-old flat track Nipper. James being eight was only able to train and receive coaching, but the Moto Stars Junior GP Road Racing Series allows racing over the age of nine as per ruling from Motorcycling Australia. We did a track walk and found it to be a beautiful but technical little circuit with good visual markers and references. The track is set among bushland with plenty of scenic gum trees providing shade over the track. They are of course, safely located behind tiny, well-built tyre walls. The track has 12 turns and we ran anti-clockwise in the morning and reverse direction after lunch. Cudlin described the track as a bit challenging, and also very good to teach on. James who rides in Nippers loved the track as it was exactly in proportion to his size. It’s a miniature racetrack with flag marshals, run-off areas, pit entry, exit and a control tower. 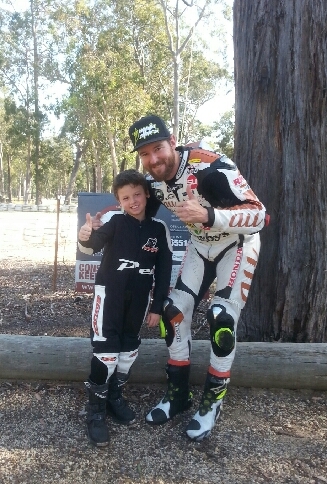 James was lucky enough to get his Junior Road Racing suit through OZ MC Leathers, a Pee Wee junior suit, mostly textile with leather panels in the appropriate protective areas with a motocross body armour suit underneath to ensure excellent protection. He wore his junior dirt bike boots and motocross helmet but the boots were a bit restrictive because they were stiff in the ankles. The helmet was fine while riding the motard, however the visor reduced his vision in the more aggressive riding position of the Kayo. We will get him some road racing boots and a road style helmet for next time. We also managed to obtain some full leather junior road racing gloves in his size which are vastly more protective than his usual dirt bike gloves. As in any track day we started with a Rider Briefing with Cudlin and Course Controller Cody. The three sessions to be scheduled were Juniors (under 15), Seniors, and then Supermotards. The first session on the Kayo MR150 for Sal was a bit tricky, getting used to being folded up into the position of the tiny bike, while Cudlin demonstrated the right lines. After the first Seniors session the supermotards were unleashed and proceeded to cut sick around the track. Apparently some days have allowed the motards to run laps of a combination of tar and dirt but that was not happening today. There were some very talented riders there running slicks and tyre warmers, and they were going insane, backing it in everywhere. I ran in Seniors and described the session as awesome fun. I thought I may benefit from a heavier spring in the rear of the Kayo, which there is an adult set-up option for. The 150cc four-stroke motor offered plenty of torque, and was able to pull my 105kg around no worries. 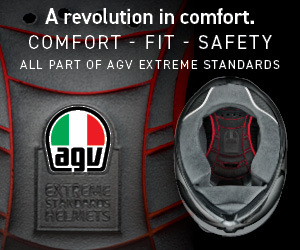 For Juniors weighing around 22kg in comparison, the Kayo goes like a rocket. The bike we rode came with the standard slick tyres which took a couple of laps to heat up. Some of the other bikes there had the newer Bridgestone control tyre which offered better grip and profile, transforming the bike totally. These guys also had tyre warmers allowing them to just get straight into it. Most of the heavier Seniors including Cudlin were flying. The momentum through the little tight corners was insane and the bikes were so nimble that it was easy to change line mid corner. 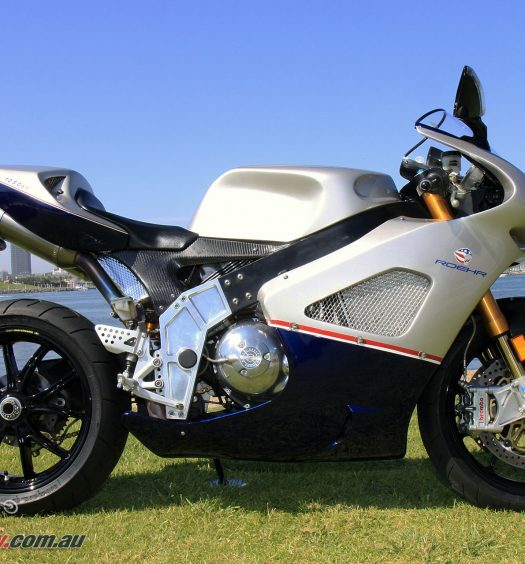 The bike looks awesome, like a half-sized GP bike. The styling offers a generous cockpit for the smaller riders which it was designed for. 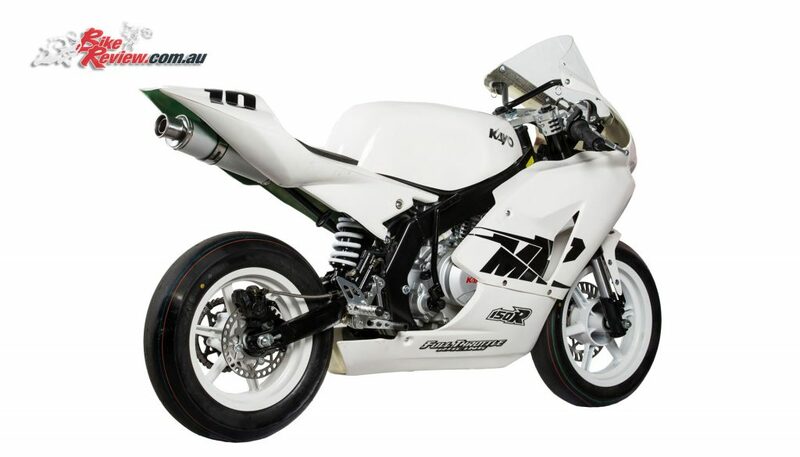 The full fairing comes in white but looks awesome in full race paint as we witnessed from some of the Kayo enthusiasts present on the day. 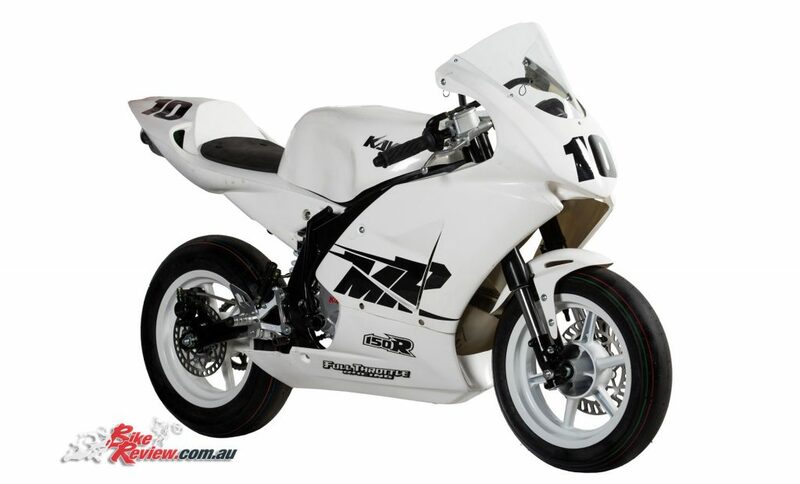 The bike can even be ordered in full custom race paint according to your preferred design. The engine was quite torquey, providing excellent drive off the corners, even for a 105kg rider, yet revved out to ten grand and provided really good horsepower on the straight. The suspension would be great for a Junior but a range of springs and rear suspension units were available for the larger, heavier, or Senior competitors. A list of tuner parts, modifications and upgrades are also available, as well as gearing combinations for different track applications. After the second session Cudlin suggested to Sal to get off the bike more and really exaggerate her body positioning. This proved to be a whole lot of fun on the tiny bike. Unlike a major racetrack event, the logistics on a little track allow a reversal of the direction easily, without a logistical nightmare. This keeps it interesting and effectively allows two tracks for the price of one. James rode like a little champion in the Juniors sessions and had lots of fun riding on the tar for the very first time. Although he had to adjust from riding a dirtbike at the flat track, sliding around a bit and just going one direction, the moderate size and speed of the track allowed him to adjust to the road surface with its more intense grip, lines and technicality in a safe and controlled environment. 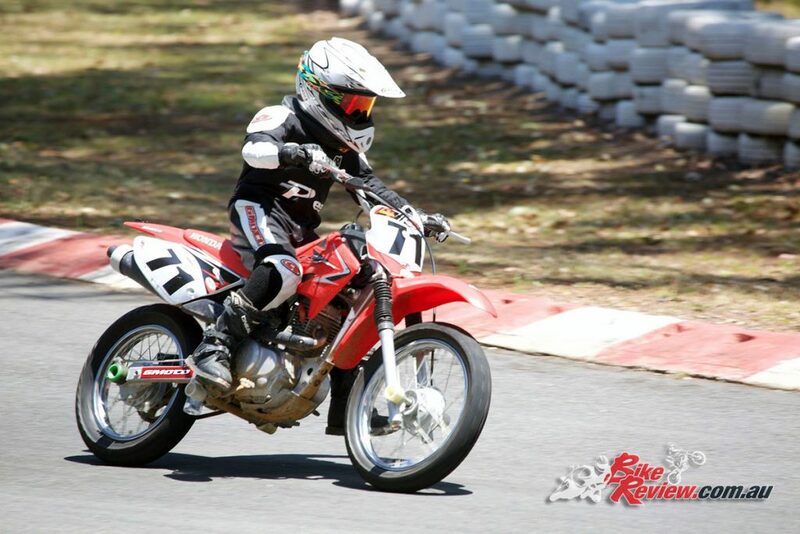 James rode his CRF80 for the first four sessions to get used to the track but was itching to get on the mighty Kayo. He was corrupted by power instantly being so light and he loved it. He had a smile from ear to ear. Cudlin’s approach to training was excellent, he didn’t give James too much information at once so James was able to understand and practice the tasks a little bit more as he progressed throughout the day. We had such an awesome experience that we are planning on adding the Kayo kart track events and coaching to next year’s calendar of Junior flat track racing and Senior ride days. The Kayo bikes are manufactured in China. The engines are built by Zongshen – one of the biggest motorcycle manufacturers in the world, who claim to produce over one million motorcycles per year, including for Harley-Davidson and Piaggio. 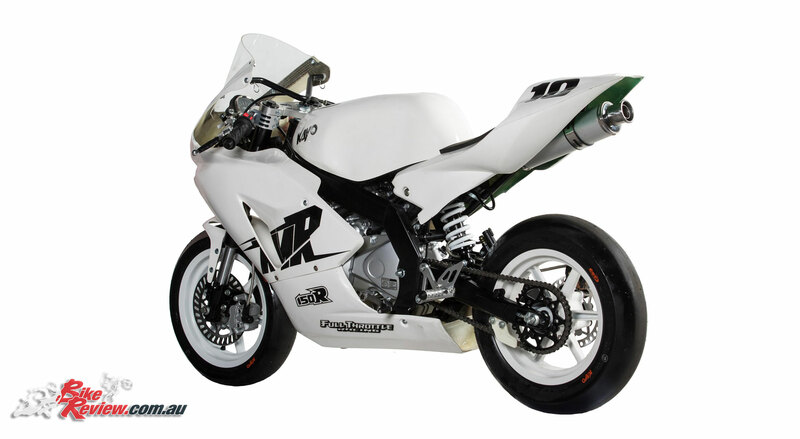 Zongshen specialises in small capacity motorcycle engines with a range of motors from 50cc through to 250cc. 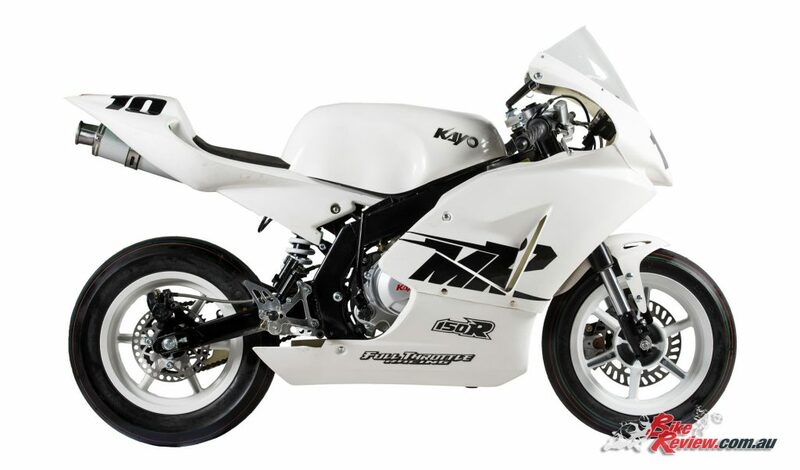 Kayo motorcycles are already popular in all other parts of the world such as Europe, the UK and Malaysia, where most riders use them on smaller kart circuits. 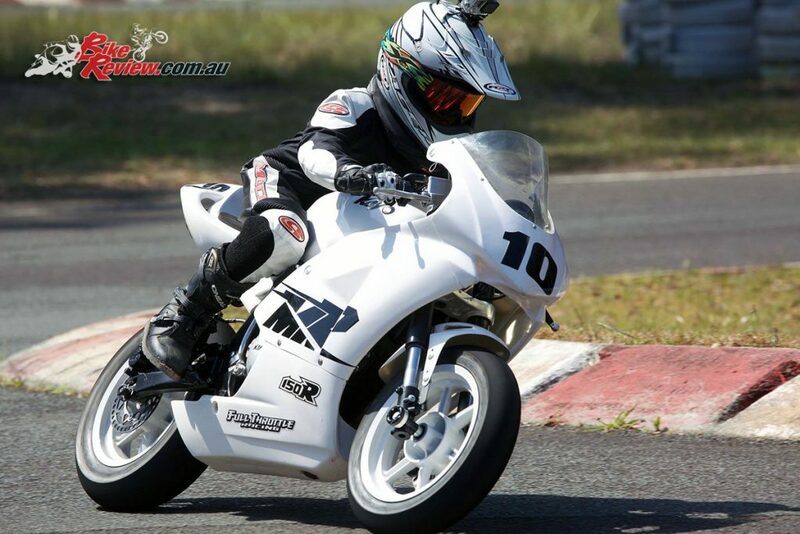 There are plenty of clubs that run events, including the North Coast Road Racers who have designated classes for the Kayo 150s.There are also track events in Port Macquarie, Coffs Harbour and Newcastle with hire bikes available. 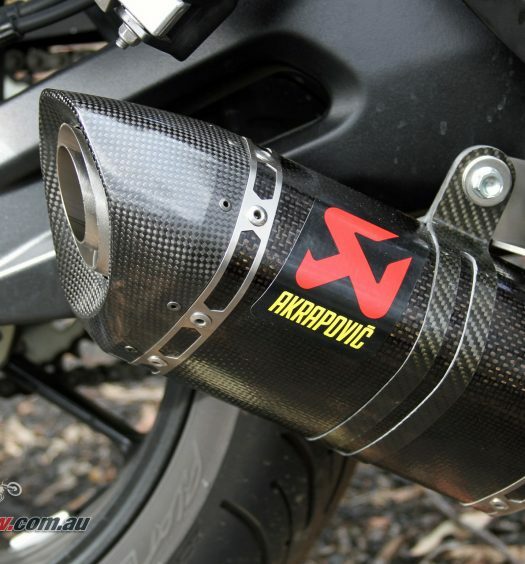 A huge range of tuning parts are also available.